Sorry about the absence, I’ve actually had lots and lots of things to blog about, but both my boys woke up very sick on Saturday and we are still recovering. We’ve been busy none the less! Way way back in December we went out to a tree farm in the country to get our Christmas tree. The tree was purchased, and we were driving toward home when I briefly glimpsed — was that a herd of alpacas?? After a U-turn we went and investigated the farm. Indeed, there is an alpaca farm 20 minutes from my home. Then I got a wheel for Christmas, and I’ve been more tempted to arrange a visit, but life happened and I never did. Until my good friend Mrs. Fishtrap asked me if I knew of any farms where we might take the kids on a little field trip. An excuse to visit the alpacas!! and I emailed the owner (coincidentally, another Peggy) last week. So this past Sunday brought us out (camera-less, sorry) to Alpacas at Tucker Creek, where I received my first introduction to these wonderful animals. The boys and I spent a wonderful 2 hours there, meeting some animals, burying our hands in their fleece, and just talking. After visiting all the animals our talk turned to spinning and knitting. 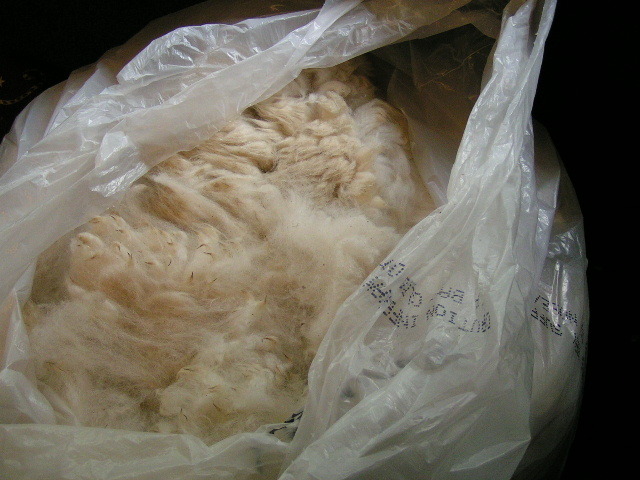 This farm belongs to a cooperative, which means they pool fleeces when sending them to a mill. Peggy was interested in having a local person spin only their own animals’ fleece to be sold in their shop. It’s a little more special to visit a farm and then buy yarn spun from a particular animal you just petted 5 minutes ago. I was game! So, more serendipity and I walked out with 2 years of blanket fleeces from Franchesca –scroll down and click her name. Check those micron counts: 17.2 and 18.8. Yes my friends, those fleeces are sitting in my bedroom right now. 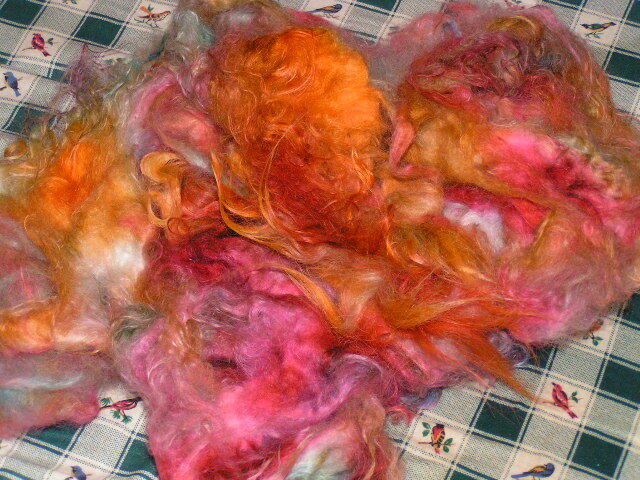 And alpacas secrete no lanolin, you can process this stuff without washing it! The fact that I’ve yet to acquire handcards does not disturb me in the least. I’ve been combing locks with an old plastic hair-comb. Lowtech works for me! 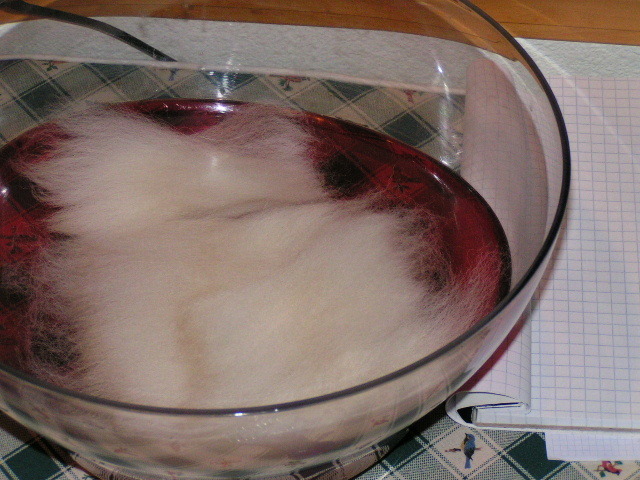 I chose a white fleece so I could dye some too. This stuff will need to wait for actual carding equipment, but still! 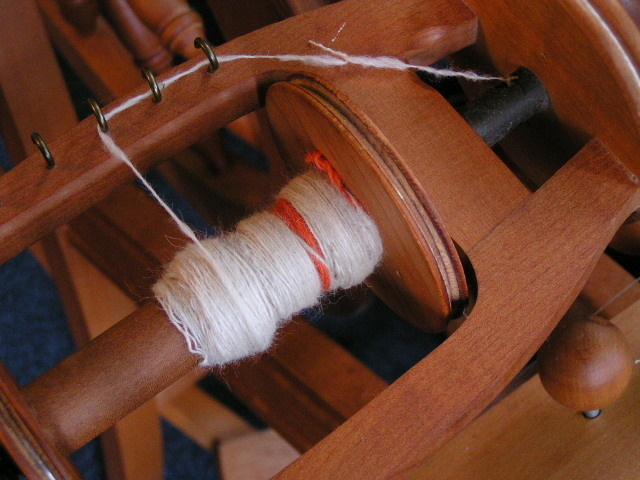 Anyone else for spinning a sunrise? You can bet we’ll be visiting again soon! Thanks for all the interest about the Moody Socks. I forgot I’d already mostly written the pattern out a few months ago. So instead of a very boiled down version, I’m offering the probably-more-words-than-you-wanted version. But I think the instructions are quite clear, and multiple sizes! So, pattern below, or queue it up here on Ravelry. Now, the real reason I’m posting again after doing all the pattern stuff – it was indicated by several people that they have had enough winter. 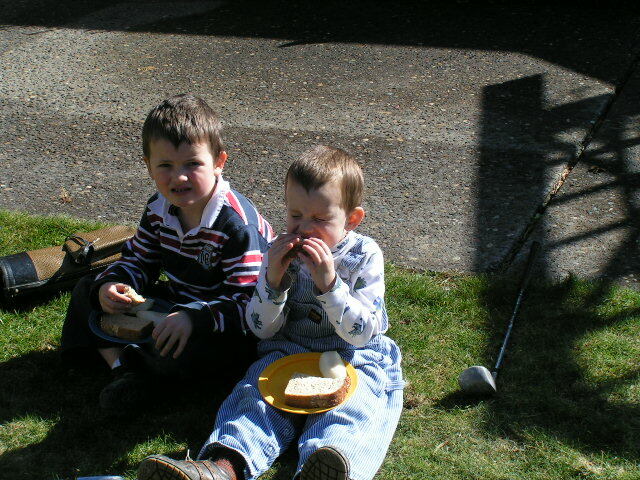 My boys had their first picnic of the year yesterday. We’re sending everyone warm thoughts!! I’m horribly out of the loop, but here’s a quick update. Sunday, Dec. 2nd a huge storm pounded the Pacific Northwest. And it pounded, and pounded, and pounded until about 11pm Monday, Dec 3rd. Want to see some pictures? This is our local paper’s coverage. This is the larger state paper’s coverage. Our family was very fortunate. We lost one big tree in the backyard, and were without power 3 days. There are others around here with trees on their homes, roofs blown off by the wind, floods, and who lived without power almost a week. We were very fortunate. The community clean-up and recovery work has been wonderous to see. Everyone took care of each other, whether with a chainsaw, a generator, a warm fireplace, or fresh water. Everyone was taken care of, the community has been amazing. We (finally) got internet back up today. And it seems like life has started to return to normal. And that big tree we lost in the backyard? It’s going to be a perfect treehouse for the boys. Today we chose an ornament from the giving tree, or whatever it’s called, to help provide Christmas for a local child in foster care. I want to make that not-loved-enough child something very special. Something that requires my attention, my heart, my hands, and my time. I want to include a handknit in this foster child’s Christmas package. That kid needs one. I am only one knitter, and I can only help one local child this Christmas. So this holiday season I have a challenge for the knitting community. Make a handknit for charity. Include it in a Christmas package for a needy child. Now, I wish I could send you all yarn for participating. But I can’t. This is what I can do. For every holiday package in which you include handknits for a needy child, I will donate $1 to Knitter’s Without Borders. I will donate up to $500. I’m going to think of it as getting a jump start on the next year’s stash diet. I’ve set up an email account for you to tell me all about your handknits, send me links and send me pictures before you send them off to a new home. knittingchallenge [at] gmail [dot] com I will leave the challenge open until Jan. 1st, 2008. This is just like a sweater, one stitch or one row or one pattern or one sleeve isn’t going to get anyone very far. So spread the word! Edited to add: I swear I thought of this before YarnHarlot posted about KWB today!